The Rock Street Chemist shop in 2007. Before Tom Gibson took it it was known as Kielsdens. Tom and Sheila Gibson were from Scotland. Tom ran the chemist shop in Rock Street Brighton. 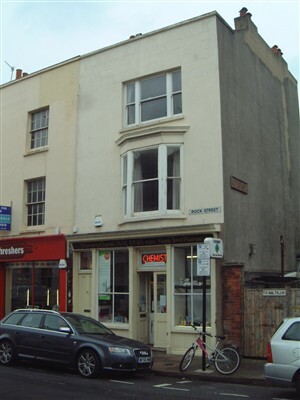 This was a prime location as the customer catchment area the shop covered was roughly bordered by Sussex Square, Lewes Crescent, in the East, Paston Place in the West and parts of the Manor Farm estate to the North. During their honeymoon Tom and Sheila had been involved in a fire at the hotel they were staying in. They had to jump for their lives from an upper floor of the hotel and the resulting serious injuries had left Sheila with a degree of incapacity. With the birth of their baby boy named Duncan, Sheila felt she needed some help with cleaning and general management of their flat above the shop. My mother Amelia, known as Milly, was recommended to Sheila as a trustworthy hard working person and my mum commenced part time work at the flat. shop-keepers and this extended to the service offered by their chemist. Many of the customers wanted their medicines and potions delivered to their doors. In a discussion one day between Tom Gibson and my mother the subject of assistance came up and my mother suggested that her baby son, then aged ten years, could help after school. Tom jumped at the chance of having a delivery boy and someone who could carry out other tasks. I was duly employed at the handsome sum of Half a Crown for two evenings and Saturday mornings. In addition to delivering medicines to the doors of customers the other jobs included washing medicine bottles, keeping the cellar tidy, stocking up the medicine bottle storage, ensuring that there were sufficient corks of all the different sizes to fit the different types of bottles. Another regular job was carrying coal in two large coal-scuttles, from the farthest extremities of the cellar, beneath the pavement, through the cellar across the yard, up the area steps leading to the shop, through the shop, out onto the pavement, into the hall of the flat and up the stairs to the flat. There were other jobs which were not of a regular nature but undertaken on an ad hoc basis. One of these was taking baby Duncan out in his Silver Cross pram. The evening hours of the job were from at 4.30 pm until 7.30pm and from 9am till 12noon on Saturday's. The job was fine on the light summer evenings but this could change when it came to winter. Many of the buildings where deliveries were required were in the regency style buildings of Sussex Square, Lewes Crescent, Percival Terrace etc. These buildings were full of long corridors, staircases and odd nooks and crannies. Very little if any natural light was able to permeate these areas reliance being placed upon electric lighting. Obviously simple economics dictated that the lights should not be kept on longer than was necessary. On entering the main hall of the buildings you had to locate and press a button, which was an early type of electric timer, the lights came on and were supposed to stay on for sufficient time to reach your destination. Much of the equipment being old had ceased to work efficiently and the light usually went out when a person was half way up a staircase or in mid corridor. At the age of ten you tend to have a very vivid imagination with ghosts ghouls and monsters much to the fore. This imagination can cause untold fear to a ten year old alone on a dark evening in a dark building when the lights suddenly go out, and the immediate reaction is to beat a very hasty retreat. But you could not retreat you could not let Tom Gibson down or the poor member of the gentry or acting fraternity who you imagined were dying for want of the contents of the parcel under your arm. The medicine just had to get through. Groping on the dark with every creak of the stairs or draft on your face heralding the arrival of Frankenstein or some other horrific being you simply had to carry on. Many of the people you were delivering goods to were scary themselves with some of the elderly ladies still wearing long dark clothing reminiscent of the Victorian era. Many of the older people were bent and misshapen from years of toil with none of the medical aids we enjoy today, so these people themselves could increase the fear level. At times it was a great relief to find that the person did not answer the door so that you could leave the parcel neatly on the floor beside the door and beat the desired hasty retreat to the safety of the dark streets. Of course the delivery duties were not all scary some were positively enjoyable. One of these was delivering goods to Anna Neagle the famous actress. Her maid would always answer the door and invited you in to the presence of the great lady who would thank you personally, ask how you and your family were and give you a tip. Many of the gentry were also most kind one in particular was a Lord who had a butler. The butler would answer the door and always state, "I am directed by his Lordship to thank you and to offer this small financial reward". At Christmas you were always invited into the kitchen and given a minced pie and a Christmas gift. The pie and the gift were always given by his lordship personally. One address where a hasty retreat was always performed was number 25 Sussex Square. This was used as a home for elderly men who had fallen on hard times or were suffering from mental problems associated with the elderly. To a small lad who did not understand the social or medical issues these old chaps could be very scary indeed and deliveries were always made very, very quickly. There was another address that was a positive joy for a young man fast approaching puberty to deliver to this was St Mary's Hall school. The matron in charge of the school sanatorium placed her order for medical supplies with Tom Gibson and it fell to me to deliver them. There were strict instructions not to go anywhere near the main school in pain of death or worse debagging by the girls. The sanatorium was separated from the school and was adjacent to the tennis courts and hockey field. There was a rough track leading from Eastern Road around this area and this was the route that had to be taken. Entry to the sanatorium was never allowed the doorstep was as far as a mere male ever got. There was a compensation in the summer when all of those lovely young girls played tennis dressed in short shorts. The retreat from this are was anything but hasty. Another regular job was going to the wholesale chemists to collect items that could not await the regular deliveries they made. One of the largest wholesalers was a firm named Barclays who had their warehouse in Devonshire Place. Tom Gibson would give you an order and you would take the bus to the top of St James's Street, this was not a one-way street in those days and traffic flowed in either direction. On reaching Barclays you entered the entrance marked "trade counter", rang a bell and eventually an assistant would arrive. As I have said the hours of work in the evenings began at 4.30pm so if you were sent to Barclays in the late afternoon it was very near the time that they finished work when you arrived, the last thing they wanted was a youngster ringing the bell clutching an order, so your reception was anything but welcoming. One way that the assistants had of expressing their wrath was to make the load of the order heavy or difficult to handle. This usually took the form of a large box with no handhold and no top to it. If you dropped the box the contents spilt out there being nothing to stop it. Leaving Barclays you had to stagger to the bus stop at Rock Gardens and await the arrival of the bus. In those days very few people had cars most using public transport with the result that late in the afternoon buses were very crowded with persons coming home from work. Eventually the bus would arrive and the small lad with the large unwieldy parcel would attempt to board. Many a time unfriendly fellow passengers would complain and the conductor would make you get off the bus, the only option then being to stagger back to Rock Street by foot. On one particular Saturday morning visit to Barclays the large box contained packages of things that only ladies ever purchased that came in far larger packages than their equivalents do today. On attempting to board the bus, the bottom fell out of the box and all of the contents including the unmentionables scattered over the pavement and into the gutter. The embarrassment of a ten year old can be imagined. When Duncan Gibson was about 1 year old it was decided to extend my duties to occasionally taking him for walks in his large prestigious pram. All of the buses that served the Whitehawk estate where I lived passed along Rock Street so anyone walking the street was seen by the bus passengers. As a youngster I was very self-conscious and easily embarrassed, and to be seen by my mates and neighbours pushing a pram held nightmares for me. Poor Duncan, his walks were taken very quickly until we could turn from Rock Street into the adjoining Mews and other quiet by-ways where we would not be seen. Washing the medicine bottles could be a frustrating job. I was rather small for my age and it was difficult to reach over the butler sink that was located in the back of the shop. It was decided that I needed a stool to stand on, this was fine but after a while my legs started to ache and it became very uncomfortable. The water used to wash the bottles was cold and no washing up liquids were then available. A long brush was provided with which you had to remove every mark. Medicine bottles in those days were narrower at the top with shoulders at the entry point of the neck. To try and manipulate the brush around these areas and remove every mark was almost impossible. The worst mixture to remove was anything containing milk of magnesia as the chalk like deposits refused to be moved. So with aching legs and ice cold, wet hands this task was not very pleasant. One day there was a knock on the door of our home in Fletching Road and on opening it my mother was confronted by the school attendance officer. Apparently these officers had an extra duty and that was to investigate child labour. It was explained to my mother that she had been reported by an anonymous person for allowing me to be employed under age and that to employ a child under the age of 13 years was illegal. It was also explained that the employer and the parents faced possible prosecution. My mother being a most law-abiding person immediately agreed that my employment would cease, thereby avoiding proceedings. Reaching the age of 13 I re-commenced my work with Tom Gibson but by this time I negotiated a 50% increase in wages to five shillings for the same length of employment. This page was added on 25/09/2007.